I can’t tell you how many agents over the years have said, “I’ve been burned by that before” or “Well, this other company promises…” One reason I started Tosten Marketing was because I disliked seeing agents get taken advantage of because the complexity of the web was too much for them to manage. Five and half years later I still talk to agents who have been taken advantage of. Let’s take a look a couple of these common promises that should be red flags. This has to be the most common one I hear or see. Companies sending SPAM email that guarantees page one Google rankings. They even send them to our company email. The only way to guarantee page one Google Rankings is through a Google AdWords campaign. That’s it. These companies advertise themselves as SEO companies, but in reality, all they are doing is taking your money, siphoning some off the top and handing the rest to Google. 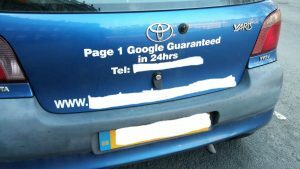 AdWords is a great marketing tool, no doubt, but don’t be fooled by someone claiming they can guarantee ranking other ways. Only Google knows their algorithm and it changes hundreds of times per year. Now, if you were not in the most competitive industry online, insurance, and perhaps a taxidermist, you might be able to guarantee page one rankings. Managing a web server is a lot of work. Many companies say “Get started for $2.95!” While this might be okay for a small, couple paged website that gets minimal website traffic, it just won’t work for most businesses. Not only do websites themselves require updates and malware protection, you also have bandwidth usage to monitor. Most insurance agency websites can run off of a basic web server plan, but keeping that site up and running is another story. We recently talked to a major malware monitoring company who said their minimum fee was $5,000 to remove malware from a website. While that is seemingly ridiculous my point is you won’t find an all-encompassing web host for $2.95 that serves all of your needs. This one cracks me up. Let’s keep the answer simple. 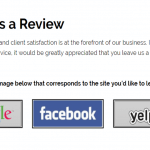 If you website is functional, the search engines will find it! Additional Search Engine Optimization techniques can certainly improve your positioning within the search engines as well as off-page optimization, but don’t fall for the ridiculous claim that you need to pay a company to “submit your website” to a search engine. It’s just not true! Web marketing is complex, no doubt. But, avoiding these common, misleading marketing schemes can save you time and money. Talk to a reputable company and never sign on with a company who sends you an email unsolicited. Do your research, ask for references and you’ll be fine. If we’re lucky enough to talk to you, we hope you found us through a search engine, referral from an existing agent or one of our many partner insurance carriers. Good luck with your marketing!